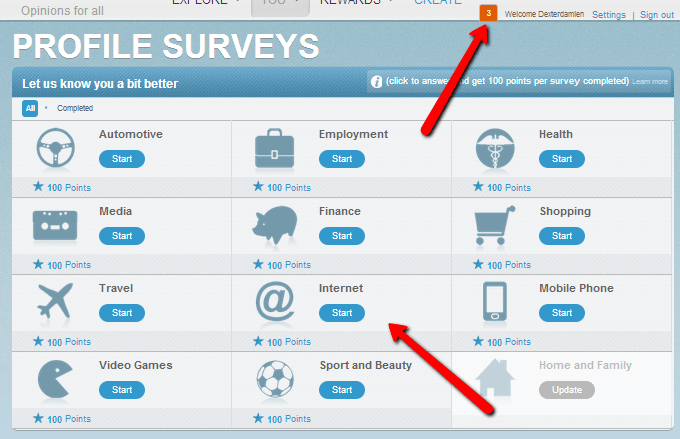 If you have been visiting my site often, you would have noticed that I joined a lot of those Survey Companies which let you take part in surveys, earn points and convert those points into Vouchers as well as Cash! I have also commented in this blog on which survey companies are good and which are the ones simply not worth investing your time! Buy Gifties (Some Animated Icons) with the Possibility of having them become Real Items! There’s even an Area where you can take part in Testing out (Physical) Products (note: currently there’s none at this point of writing so I will not be able to share anything much). This is something interesting as compared to those Survey Companies that I have joined! To get started is quite simple, if you have clicked on the link above – you will be given a short introduction of what Toluna is all about and if everything is good to go, just click onto “Join Today, It Only Takes 2 Minutes” and you will be brought to the Main Page of Toluna. My suggestion is to go for Option #1 and link up with your Facebook Account after everything is done. I have tried Facebook Connect and the site has defaulted my Country of Origin to United States when I am in Singapore – and there’s no way to change this so I have to cancel the account and sign up with another email address! A verification email will be sent to you upon signing up and do note that this may take a while to reach your email inbox (around 10-15 minutes)! So while you are waiting, just proceed to fill up the rest of your personal details. If you have your PayPal Email Address, you can click on Settings > PayPal Details and fill in there! By filling up these Profile Surveys, you will have earned yourself 11,000 points and if you notice a Red Box with a Number in it that is beside your Username, click on it and you will be able to take part in those Quick Surveys which earn you around 60 – 90 points each! Keeping coming back every other few days to take part in those Quick Surveys or wait for a Survey to reach your Email Inbox to earn those big points! Note: To cash out in Vouchers or Cash, the Minimum Point is 20,000 Points. By doing the above, you are 80% close to redeeming your Survey Points! This is my first tryout with Toluna Asia so it may or may not be a good deal after all till I have personally gone through most of the surveys and done my first cashout. 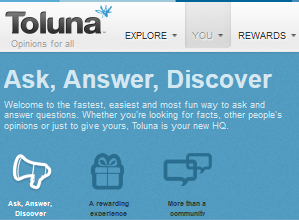 So if you have joined Toluna Asia before – what’s your view and take on this Survey Company? Is it worth investing our time on it?